Wasp nest control - how we kill wasp nests? The first question you will ask yourself upon finding that you have a wasp nest is: how do I get rid of it? A wasp nest is an unusual problem for people to deal with. Apart from the risk of being badly stung, you can not just pull it off and throw it away. If you physically destroy the nest, how do you deal with the foraging wasps that were not in the nest at that time? Sometimes wasps that have had their nest destroyed will start rebuilding the nest from scratch. Don't panic; we are specialists in wasp nest control and also hornet nest treatments. When possible we also try to provide a service on the same day as you call, so for those people that do not like wasps at all, we are here to help, and we guarantee that we kill your wasp nest. 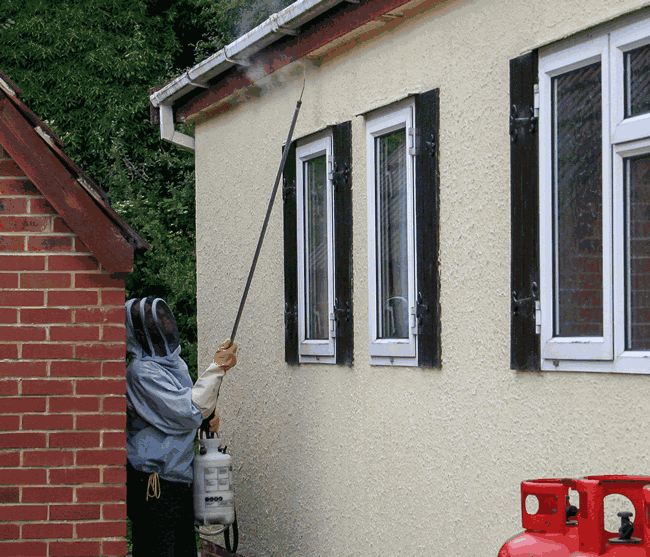 To give you a basic idea of how we carry out wasp nest control we have written a few notes to explain the process, so you will know what to expect. When we come to your home to treat your wasp nest, we will identify all the entry points to the wasp nest or if possible locate the actual nest. We do not necessarily need to see the nest to destroy it. We apply an insecticide which will kill the entire nest. The products we use are professional use insecticides (not available to the public) based on either bendiocarb or permethrin. To be able to purchase these products, we have professional training in the application of insecticides and their proper use. The insecticide is applied under pressure and blown into the nest entrances from a pressurised applicator. If the nest is visible, we can stab and inject the insecticide directly into the inside of the wasp nest. The wasps, upon returning to the nest walk through the treatment that has been applied carrying it into the nest thus contaminating all the occupants within the nest. A lethal dose is also blown into the nest. The insecticide is fast acting, and the nest will die by the end of the day (often sooner) once all of the inhabitants return from their daily activities. Sometimes directly after treatment, the wasps become agitated by the application process, and we advise customers to keep children and pets indoors, and all windows and doors closed for a time after treatment, to be on the safe side. The last thing we want is anyone getting stung when it is easily preventable. When you call us out to deal with a wasp nest, all you need to do is point us towards the nest location and then stay away while we do our job. This method of wasp nest control is by far the safest way of dealing wasps or hornets and is used for all types of nest no matter where their location. We have never failed to treat a nest successfully, and we have never come across a nest which we couldn't manage. Do wasps nest in trees and bushes? Yes, German wasps do build nests in trees and bushes. Yes, common wasps do build nests in old vole and rabbit burrows, under walls, patios, just about anywhere that they can fit and where it is dry with enough space for them to build their nest. How can you tell if a wasp nest is active? If you have found a wasp or hornet nest and you are unsure if it is "live". From a safe distance take a moment and watch the nest, if it is active you will see wasps leaving and returning to the nest; also you will see wasps crawling over the exterior of the nest as they make repairs and add nest material. Take a look at our wasp nest videos to see what an active wasp nest looks like. Sometimes you will find small "starter nests" (up to 3 inches in diameter) in your shed or loft. If it is late summer (July onwards) then you can be almost sure that the nest is not active, a queen started building the nest in spring and for one reason or another has stopped. Maybe she was killed, or perhaps she just decided that the location wasn't good enough. Any nests in late June/early July bigger than 3 inches could potentially be active. How do I know if I am allergic to wasp and bee stings? You will know if you are allergic to wasp and bee stings when you arrive at the hospital in an ambulance after being stung. Whatever your wasp problem is, we can deal with it for you in a fast, friendly and safe manner, preventing anyone from going through the discomfort of having a nasty sting.